The Pit Mine is a room inside of the Secret Mine in Luigi's Mansion: Dark Moon. The Pit Mine is accessed by taking the door on the right inside of the Deep Hall. The Pit Mine is a small room that was presumably used to mine for coal, as shown by the barrels of coal around the room. There is an elevator that takes Luigi to the bottom floor where there is a large machine connected to the conveyor belt and another machine that activated the conveyor belt. Several black beetles pop out from the ground as well. The door on the left takes Luigi back to the Deep Hall. During D-2: Hit Rock Bottom, Luigi needs to go into the Pit Mine to obtain coal to use in the Deep Hall. 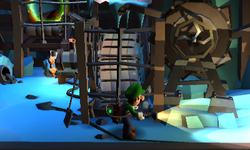 Luigi must activate the machine to cause the conveyor belt to move, and then use his Poltergust 5000 on the valve to drop coal onto the belt. This coal is taken through an E-Gate and dropped into the Deep Hall. In D-3: Across the Chasm, even though Luigi does not have to go to the Pit Mine, there is a hidden Gold Greenie that can be found here. If Luigi uses the Poltergust 5000 on the valve, instead of it grabbing coal it grabs a large, golden chunk of ice instead. This chunk of ice is sent through the E-Gate and into the Deep Hall, where it can be melted to reveal a Gold Greenie. This page was last edited on February 3, 2018, at 09:23.